From April 11 to 16, the Luminale, the biennial of lighting culture, will for the fifth time attract trade fair visitors and locals to this city on the River Main, to experience the evening light spectacles in buildings, on facades, squares, monuments and in parks. First organized in 2002 the festival has since been held in Frankfurt and the Rhine-Main region every two years. Lighting artists from all over the world, not to mention universities, designers and architects from the region now take part in Luminale. 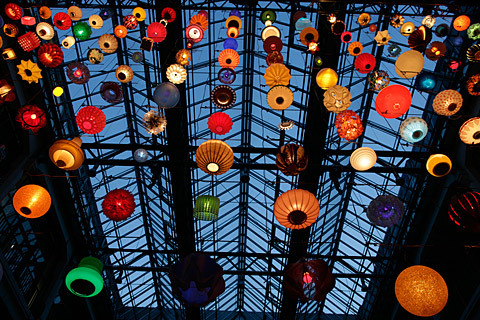 Messe Frankfurt initiated Luminale as a link between Light+Building and the city. 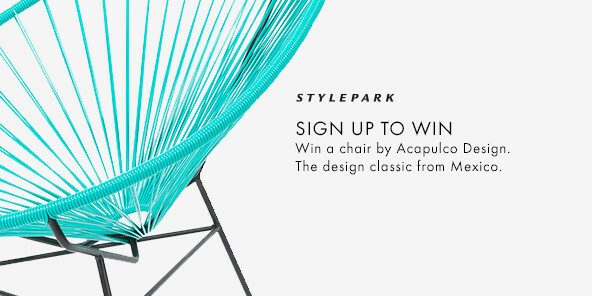 The underlying idea: the topics light, design and architecture should not only be presented and discussed from a technical perspective at the fair. 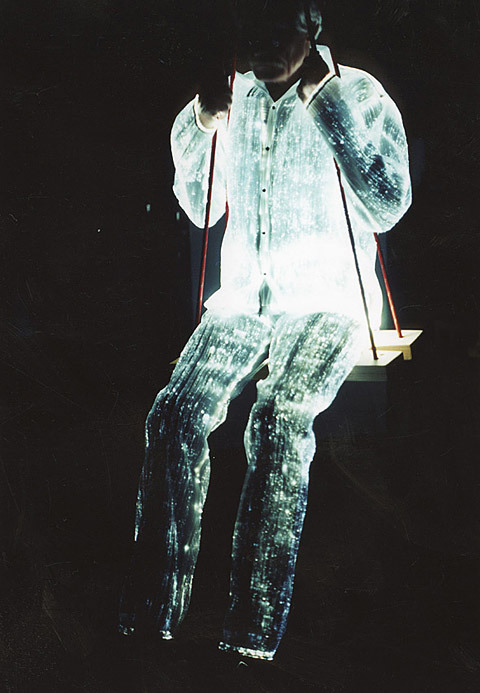 The cultural aspect of light was also to be addressed: "In the evening when the trade fair closes its doors visitors to the Luminale can experience how light alters the world. Both experts and interested locals can seek inspiration here and experience public space in a totally new manner," says the festival's curator Helmut M. Bien. 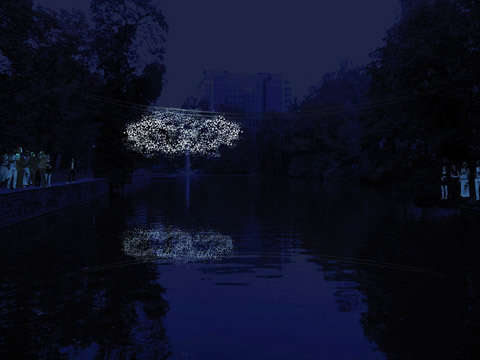 Over 150 light installations place familiar places in unusual contexts or revive little noticed areas of the city. This year the topical focuses of the festival are energy-efficiency and LED luminaires in combination with sound and movement. 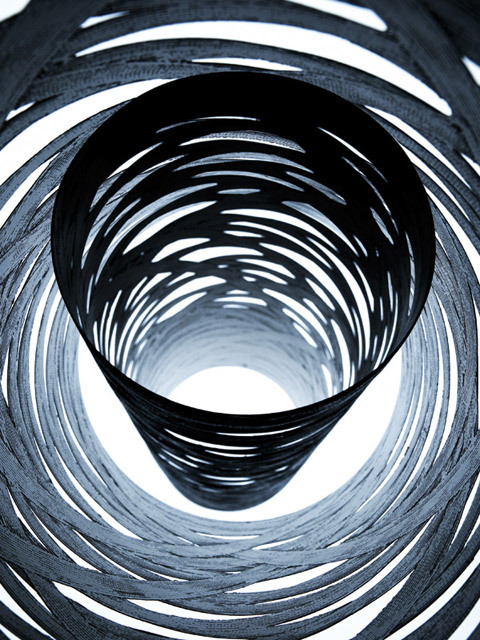 In selecting the projects there was an emphasis on the experimental concept of the artworks. The chosen projects are new installations that have not been tested much, and not the ones that can be seen at all the light shows: "It is possible something will go wrong. 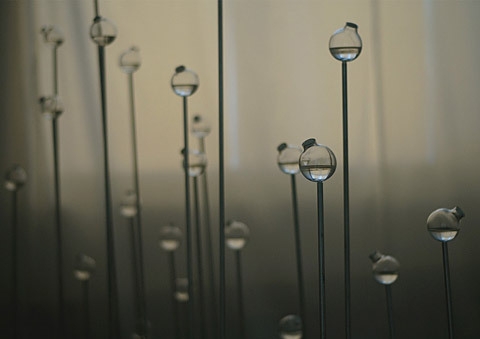 Some of the installations might not work," concedes Bien. "But that is part and parcel of an experimental laboratory." You might, for instance, start out at Frankfurt's main railway station. 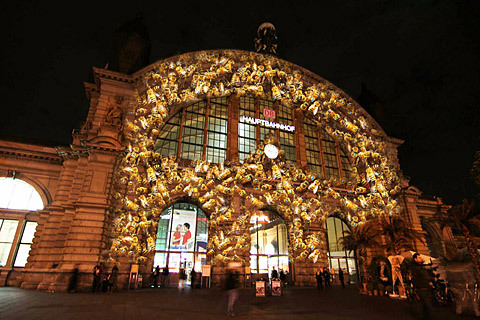 The Institute of Media Design at Mainz University is projecting larger-than-life sized swarms of animals onto the facade. 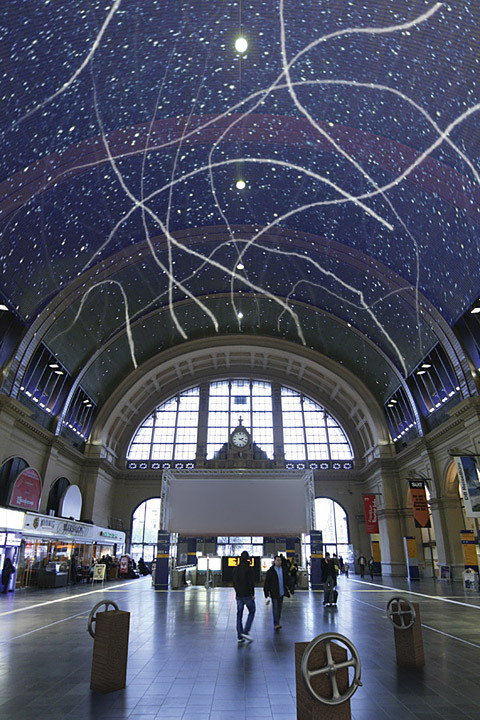 In the concourse the Institute visualizes the movements of passengers, showing them as spots of light on the ceiling. 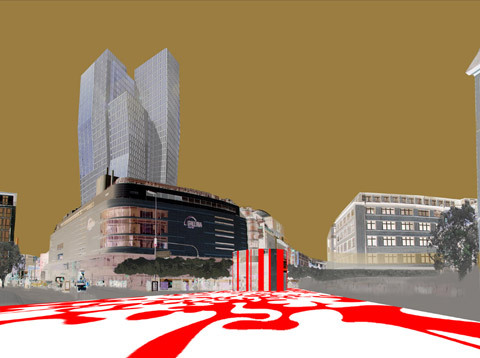 The district around the main station known as Bahnhofsviertel is increasingly developing into a quarter for creative professionals. Niddastrasse 84 is the address of the group "Nidda 84", an ensemble of architects, designers and artists, who are showing a lighting environment in their courtyard. 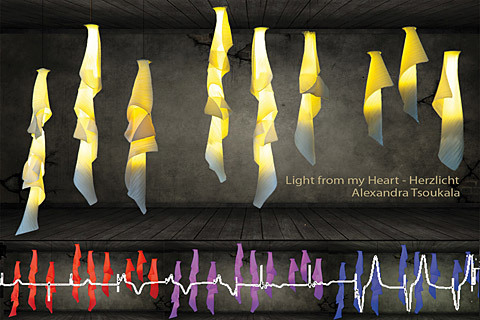 Alternately, you might hop on the free Luminale Bus bound for the Palmengarten, and get off half way at the Maritim Hotel where designer Alexandra Tsoukala has realized "Herzlicht" (Heart light): which visualizes the rhythm of the heartbeat in changes to illuminants. Not far from the Maritim Hotel and Messe is the Senckenberg Naturmuseum, which is presenting a video environment by Philipp Geist. The artist transforms the Dinosaur Room into a jungle of interwoven words and encourages us to reflect on the origins of life on earth. 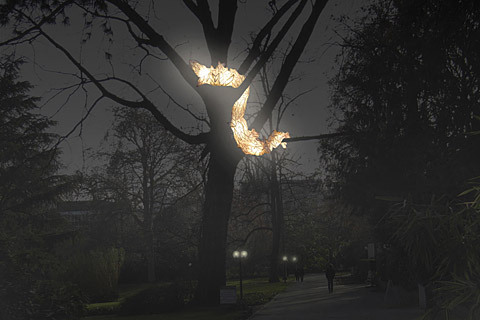 In the Palmengarten visitors can admire twelve light projects. Students of the Offenbach Design School are showing interactive installations that stimulate eyes and ears at their "Stadtlichtung" show. 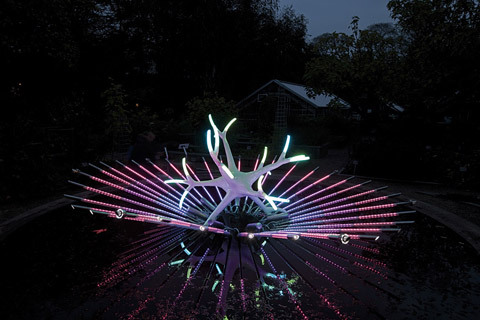 Luminous plant-like objects, light-sound-instruments, a field of bioluminescent microorganisms that respond to the movements of passers-by or the rose garden as an illuminated biotope are just a few examples of the lighting experiments. In the project "Stück Licht" student Sophia Polywka offers visitors portable "light bags" they can recharge themselves and that can be used to light their way. 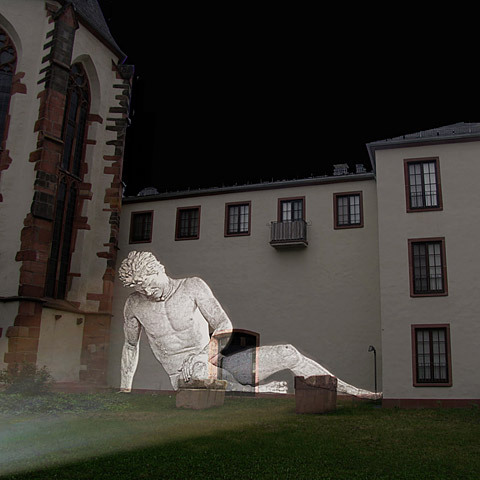 In the downtown area Wolfgang Rang uses the project "Licht.Anamorphose" to transform the Hauptwache into a spatial light puzzle. Designer Mario Nanni invites visitors into his mobile pavilion. On the Goetheplatz square Interior design and design office Frick presents as an exclusive sneak preview innovations by Italian luminaire maker Foscarini. The luminaires are integrated into an installation, which reflects the interplay of the various Foscarini products. 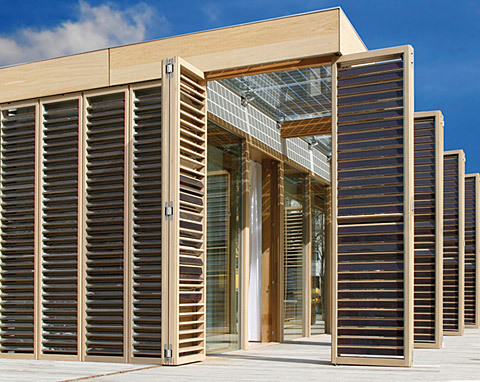 Anyone interested in energy-saving, sustainable architecture should make for the square known as Rathenauplatz to look at the Plus-Energie-Haus (Plus Energy House). But should you feel more drawn to the river you might call at the Karmeliterkloster to view early works by James Turrell or see the "Luces - Light Art from Italy" show in the Archaeological Museum. 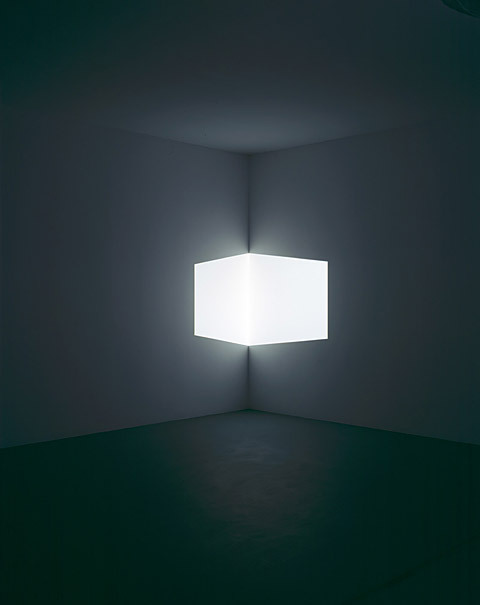 Curated by the Milan architect Gisella Gellini, the exhibition shows works by Italian light artists and starts on Friday 9 April, before the official Luminale kicking off with a preview. It is also recommended to take time to see the fortifications, which form a "green ring" around the city's historical center on the grounds where the town fortifications once stood. 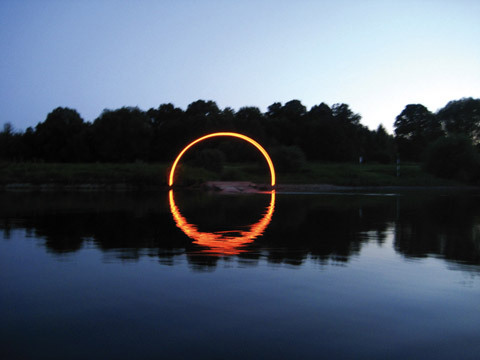 The green ring becomes a venue for action art, orchestrated walks, light installations, illuminations of monuments, ponds, lakes and hidden gardens. You should also look at the self-lighting lanterns, which effectively illuminate the pergola opposite the Alte Oper and the project "hive" above the pond behind the Alte Oper. 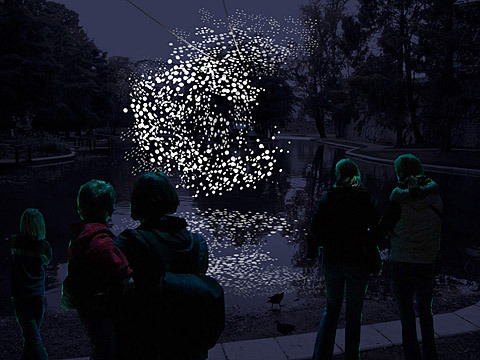 Students from Mainz Technical University used more than a thousand LEDs that can be individually addressed to create a "living", self-organizing swarm that hovers above the water. 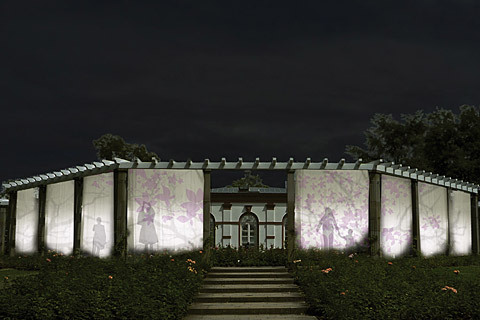 Not from the shores of the pond Rechneigrabenweiher there will be an illuminated rainbow by Paul Göschel measuring twelve meters in diameter, while in the nearby Obermainanlage complex "Lichtskizzen" or light sketches create nocturnal still lifes. For anyone who has still not had enough of the festival you can choose from over 165 accompanying events. For instance, there are symposiums and lecture series, a Pecha Kucha Light Night, guided tours, inline skating- and ship tours, not to mention various parties, such as the opening of the installation by Kehres & Hungerer, a composition of colorful lamp shades in the Kunstverein Familie Montez or the final Luminale party with a light fashion show in the Cocoon Club.